As I've mentioned before, I really love squid. It's one of those seafood that I enjoy eating a lot! Aside from the Filipino squid dishes that I've shared here before like the adobong pusit (squid adobo), calamares (fried squid rings), and rellenong pusit (stuffed squid), there is this other dish which is non-Filipino that has so much appeal to my taste buds. 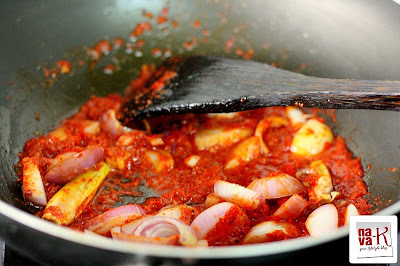 It's called Sambal Sotong (Squid Sambal). This is a Malaysian dish that has become my favorite since the first time I tried it at a restaurant. For those of you who aren't familiar with Malaysian cuisine, sambal is a chili based sauce prepared mainly from dried chillies and garlic. Sambal dishes are easy to cook but they say it takes a lot of practice to make a good sambal. 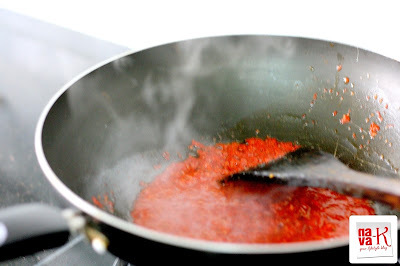 I've heard that the secret to a delicious sambal is to sauté the chilies until the paste separates from oil. 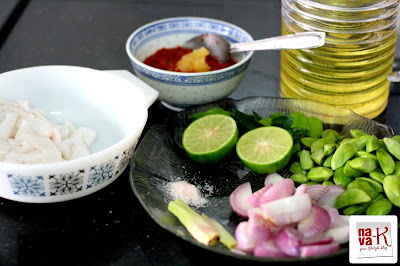 I requested my good blog friend, Nava of Nava-K.com to share with us her recipe of Sambal Sotong for our PiTCC's Favorite DIshes From Around The World series, and I am truly honored that she granted my request. I'm pretty sure that a lot of you in the blogosphere know Nava. But for those who don't, Nava is the very warm lady from Malaysia who has this very wonderful lifestyle blog where she shares her love for beauty, fashion and food. She's one blogger who has never failed to show her support for me and PiTCC since last year when I was just starting. For that, I'm truly thankful to her! She's definitely one of the Asian bloggers that I look up to. She's not only a good blogger, she's also successful with her profession as a college lecturer. Hi everyone! Let me start off by extending a big thank you to Tina for the invitation in sharing my recipe on her blog. I came to know Tina via blogging and from there on, we have developed a great friendship although we are far away from each other. I suppose like how the rest of the world is connected via technology, we are the same. We take time to visit each other’s blog, and of course her comments on my blog always brighten up my day. 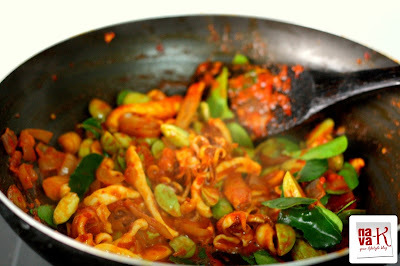 I was asked to share a recipe on squids or sotong as we call it in Malaysian term. Honestly I don't cook squids often, not that we don't like it but squids are not one of our favorites. Therefore I was quite worried, wondering if I will do a good job cooking the squids. Thank God all turned out well and my number one food critic at home, my other half, said that the dish was great and the squids were cooked just right in texture. 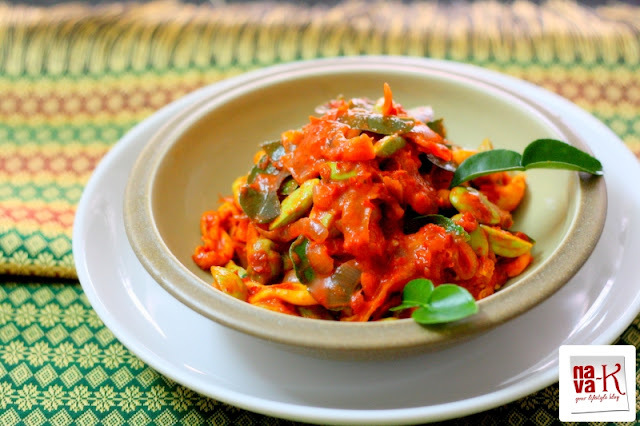 This recipe is a typical Malaysian style with the spicy, tangy and a mild sweet taste. I added another extra ingredient, that being the Petai or stinky beans. I am not sure whether you can find the beans over at your place and if it’s not available, you can do away with it. The other option will be using long beans or French beans to replace the stinky beans. I did have some difficulties in looking for the squids and the nearest I found was the smallest type. After cleaning and slicing them into rings, they became even smaller. Small squids does not take a long time to cook, thus I was done with cooking within 10 minutes or so. If you are using the bigger type of squids, you probably will have to cook them for a longer time. Do not overcook the squids as they will become rubbery. 1. When oil is heated, add blended or grounded chilies and garlic. Fry until fragrant or until they float in oil. 2. Add lemongrass and sliced onions. Continue frying for 2-3 mins. 3. Add in rest of the ingredients. 4. Keep stirring until the squids are cooked. Remove from heat. Serve with rice. That Sambal Sotong is truly mouth-watering! Thanks again Nava for sharing your recipe here on PiTCC! To all of you out there who haven't been to Nava's website, do check it out! Nava-K.com is a one-stop blog where you can find not only delicious recipes but also articles on beauty, fashion, travel and entertainment. I'm pretty sure you'll love it there! For more updates, you can also connect with her via Twitter and Facebook. Wow,my hair all standing with excitement of reading all the wonderful words you have mentioned about me. Its really touching and thanks a million Tina. I didn't think my pics were that great until I am seeing them now on your blog. I will post this tomorrow and allow me to share some great words about you. Its truly an honour to have a friend like you whom I have not met. Just like I mentioned in my blog, we should take the technology for connecting us and the friendship we have build. Everything I said is true, Nava! You're such a wonderful person, and I am truly thankful that we've crossed paths in the blogosphere! Hope to meet you in person someday! It's always nice to see wonderful bloggers working together :) Nava & I have come a long way too & I'm really glad to see her here. I like squids & this is just awesome! Great post & hosting! 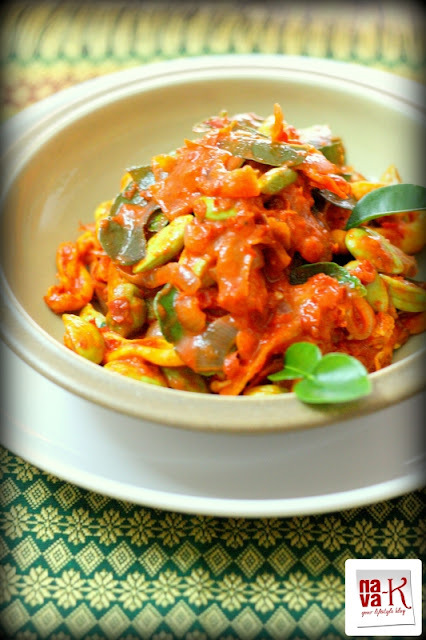 Hi Tina and Nava, this sambal looks delicious are fiery love the color. You guys done amazing job. 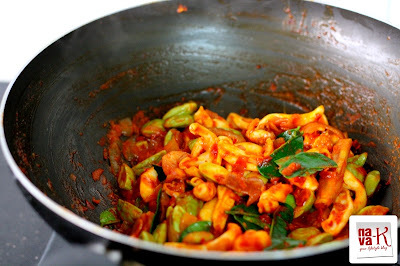 Another great post Tina,,,I love any seafood with sambal,this sotong sound very tasty. And great job Nava I'm agree with Tina that You are such a wonderful person !! I love this! Looks sooooo gooood!!! It's only 9am here and I'm salivating for this. I also love stinky beans, altho my husband made me promise not to cook them at home otherwise no kissy kissy... sigh.... french beans it is. Nice to meet you Nava! That looks absolutely delicious! Would love to try this too! This dish look gorgeous and Nava is great in using Lemon grass, kaffir leaves and red chillies. Hi Tina, your squid sambal look so delicious. I can have extra rice to go with this dish. Thanks for sharing. Nava really dd a good job on this Sambal Sotong, Amelia! I would love to try this dish...I love squid as well...unfortunately my husband does not eat it...this looks so tasty...yum! Love the flavor in that dish and such beautiful colors! I've eaten lots of squid but haven't yet cooked it--and it's on my list to cook. Now I have a great way to cook it (besides frying it). Thanks Tina! Two favourite bloggers in one! Tina, thank you for introducing Nava! Squid is one of my favourite animals too, so I'm really excited to see this recipe. Nava, your squid dish looks fantastic! I have never heard about it, but since I am getting more and more addicted to squid, I will certainly keep your recipe and make it soon. Thank you! Thank you to Tina for giving me a chance to share my recipe here and to the rest, another thank you for all the wonderful comments, appreciate it very much. Oh that looks so wonderful and fragrant with all the ingredients. Great guest post.